Yesterday, I was meeting with an overseas colleague over Skype on my phone when my phone battery suddenly died and abruptly cut off our conversation. I had no way of charging it in that moment so I had to wait another hour to contact him to apologise. I cursed my phone, but then had to ask myself the question – Was it actually sudden? The truth is, I should have taken notice of the warnings my phone was offering me throughout the day: You have 15% battery left … 10% … 5%! That’s the thing about dashboards – they’re only as useful as we make them! The same thing happens to my internal battery sometimes. I’m going along fine for some time and then, suddenly, my productivity dies. My inner resources run out. 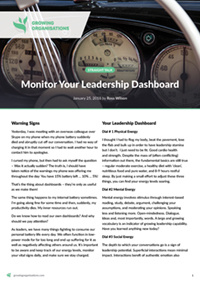 Do we know how to read our own dashboards? And why should we pay attention? As leaders, we have many things fighting to consume our personal battery life every day. We often function in low-power mode for far too long and end up suffering for it as well as negatively affecting others around us. It’s important to be aware and keep track of our energy levels, monitor our vital signs daily, and make sure we stay charged. I thought I had to flog my body, beat the pavement, lose the flab and bulk up in order to have leadership stamina but I don’t. I just need to be fit. Good cardio health and strength. Despite the mass of (often conflicting) information out there, the fundamental basics are still true – regular moderate exercise, a healthy diet with ‘clean’, nutritious food and pure water, and 8-9 hours restful sleep. By just making a small effort to adjust these three things, you can find your energy levels soaring. Mental energy involves stimulus through interest-based reading, study, debate, argument, challenging your assumptions, and moderating your opinions. Speaking less and listening more. Open-mindedness. Dialogue. Ideas and, most importantly, words. A large and growing vocabulary is an indicator of growing leadership capability. Have you learned anything new today? The depth to which your conversations go is a sign of leadership potential. Superficial interactions mean minimal impact. Interactions bereft of authentic emotion also make little impact. Learning the skills of communication and interpersonal versatility will help you reduce relationship tension and increase productive energy. Regularly having a good laugh everyday also helps, but only if it makes your stomach clench. How’s your stomach-clench monitor today? What are your strengths? How aligned with your natural talent your major tasks are will measure your leadership value and contribution. What’s your alignment compass telling you? Financial eustress is a motivator but financial distress saps personal energy through incipient anxiety. You can only help others succeed to the extent you experience personal success, especially in your financial health. What’s your personal income statement and balance sheet telling you today? Relationships are critical for leadership effectiveness. Toxicity in your network spreads like the plague and drains a leader’s and the organisational leadership’s focus, time, energy, and corporate resources. Fix it or eliminate it quickly. Never overlook this one. Being connected with your Why is vital for integrity and authenticity as a person, but it’s especially critical for leadership. When you need resources to excel, don’t settle for just the physical, human, or financial. Reach beyond. Leadership is tough, often anxious, work. Find your peace, your shalom, outside of yourself and your colleagues. What’s your inner peace dial telling you today? During the holiday season, you probably set aside some time to recharge your batteries and now you’re refreshed for the new year ahead. But don’t let this be a once or twice a year thing. I strongly recommend you schedule regular reviews of your personal dashboard. If it helps, follow the cycles in nature – the world rotates daily, the moon circles every 28 days, the earth orbits yearly. There’s your schedule, if you want one. Make time to monitor and adjust course to ensure that your health, wellbeing, and personal performance are optimal. 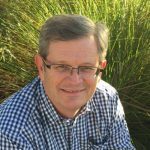 Ross Wilson is an Organisational Performance Consultant and Managing Director of Growing Organisations. For more information about sustainable development pathways and to discuss your business goals, contact us today.